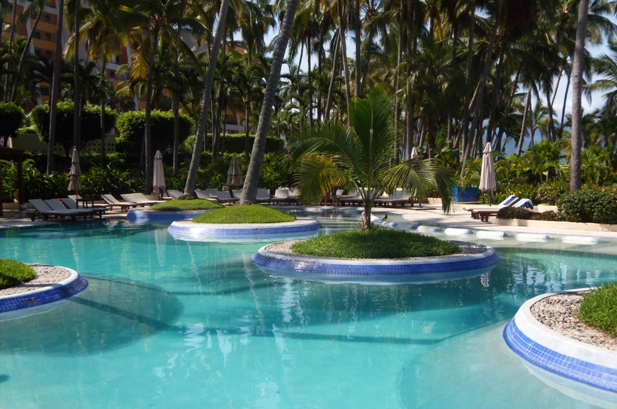 Westin Puerto Vallarta has shaded pools and a sand beach on the protected bay. 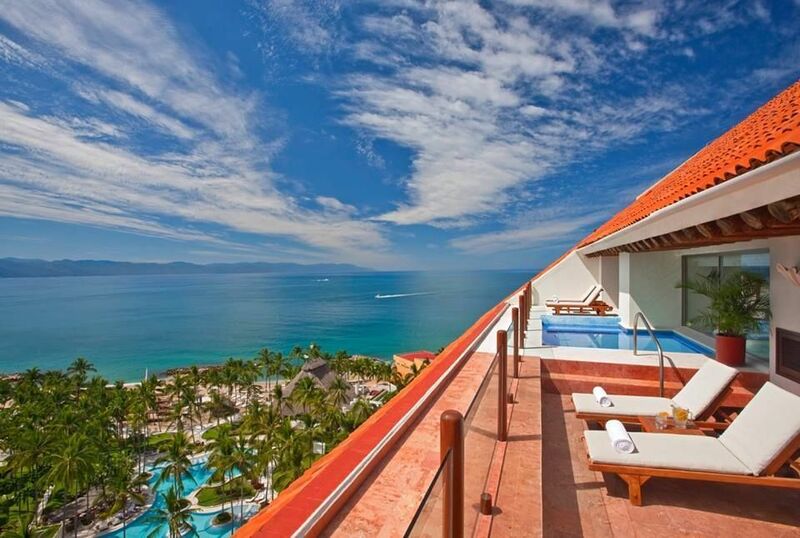 If you, like so many moms, are dreaming about getting away once the kids are safely back in school, the Westin Resort & Spa, Puerto Vallarta may be the perfect destination. The beachfront resort’s workout facilities and pretty spa guarantee you’ll be inspired to get fit and stay fit while relaxing and de-stressing. West Coast families and those close to gateway cities will also find Puerto Vallarta easy to get to, and vacations taken before the winter holiday season (approximately December 20 to January 6) are among the best values of the year. The warm, colorful Mexican décor of the Westin embraces all arrivals like amigos, whether coming as couples, families with children, or friends. The architectural details and contemporary artwork throughout the 220-room resort help separate adult areas from family groups. Couples can take advantage of the hotel’s spa, have a tennis lesson on one of three courts behind a grove of palms, lounge by the adult pool, and enjoy the third level’s open-air Bay view bar. The beachfront restaurant is ideal for a very romantic, sunset dinner; other nights should be devoted to going out and sampling the city’s famous restaurants and nightlife. Families with younger children find the spacious grounds (the 21 acres once comprised a coconut plantation) and lagoon-shaped swimming pools are ideal for together time. When parents want to detox with adult time, the Kids Club located off the lobby provides morning, afternoon or all-day supervised sessions of crafts-making and sandcastle building for children ages 4-12. SPG members get three hours’ use free of charge daily –- can you recharge in three hours? Private childcare is available on request. The spa has a tropical feel, whether indoors or out in one of the massage pergolas that overlook the Bay of Banderas. This is the place to get away from the everyday and revitalize with a massage outdoors – couples or solo — while the senses are stimulated by the beach around. The six serene treatment rooms inside invite you to explore a wide selection of rejuvenating therapies, such as refreshing facials and luxurious body masks and wraps. Regional ingredients including green coffee beans and seeds of the guarana shrub are used in many treatments which focus on awakening inner strength, in keeping with Westin’s philosophy of personal renewal. When you’re ready to levitate out of the beach chair, you’ll encounter the resort-wide commitment to staying healthy. Try the RunWestin program which provides loaner workout gear and New Balance sneakers for a minimal fee; the concierge has maps of local jogging routes if the beach is not long enough to satisfy. Kids in tow? Westin PlayWell comprises supervised active play for the kids during the kids’ club day. Gym buffs will appreciate the state-of-the-art WestinWorkout Fitness Studio. There are two large training rooms that feature a large range of equipment, from treadmills to stationary bikes, most with individual integrated TVs, and a large selection of free weights. Not motivated yet? The Westin Puerto Vallarta offers group fitness classes in spinning, yoga, and Pilates so that even those amigos who come alone will be able to leave healthier, happier and reconnected. To learn more and have a chance to win a vacation at the Westin Puerto Vallarta Resort & Spa, visit Puerto Vallarta Tourism. This post has been sponsored by Puerto Vallarta Tourism, but all opinions are based upon the author’s actual travel experience and knowledge.